Curry has struck again on the blog! Man, I never knew how much I loved curry until last year, and now I can't seem to stop eating it (Exhibit A). Lately, I've only done Thai curry dishes, but I've already been told by a fellow reader to try out out Indian curries, so I'm on the look out for those. So instead of a chicken dish, I opted to try out a sea-faring creature with this spicy broth. Enter fresh cod. 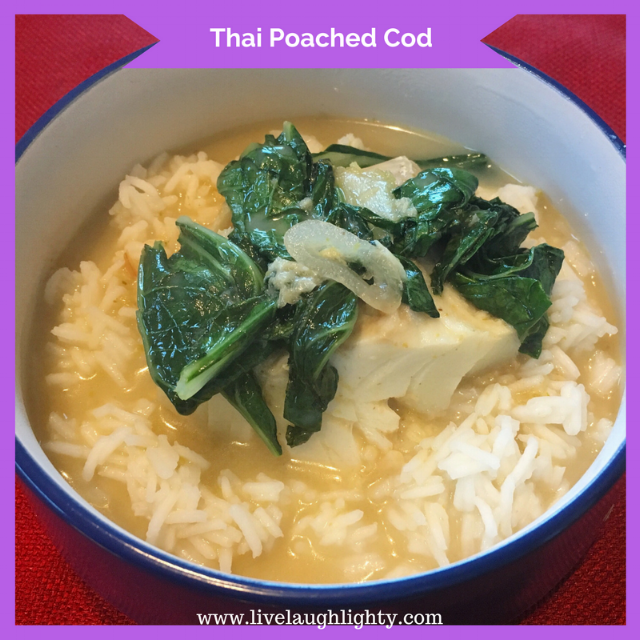 I found this specific Thai Poached Cod recipe in my good ol' trusty CookingLight magazine (April 2018). I've come to find that pairing curry dishes with rice helps cut down on the spicy, since the green curry paste I use packs a PUNCH, so that's what we did with this recipe. Most, if not all, of the recipes that end up on the blog get tested on J prior. I ask him at the end of the meal, "is this blog-worthy?". And he'll give me a honest answer. Today I asked that exact question and he proceeded to tell me how amazing it was from the time we finished eating to the time we finished doing the dishes. In other words, this recipe is WORTH TRYING! Plus, it only comes in at 283 calories per person, according to CookingLight. 2 tsp of Thai red curry paste (I used green since I had that in my fridge). 1. Heat canola oil in a 4-quart Dutch oven over medium-high. Add shallots, ginger, and garlic; cook, stirring often, until shallots are tender, about 5 minutes. Stir in curry paste, and cook until fragrant, about 1 minute. Stir in wine, and cook until liquid almost evaporates, 2 to 3 minutes. Add coconut milk, lime juice, fish sauce, and 1/2 teaspoon salt. Cover and cook until the mixture comes just to a simmer, 5 to 7 minutes. 2. Sprinkle remaining 1/4 teaspoon salt over fish; place fillets in a single layer in simmering liquid in Dutch oven. Cover and cook until fish flakes easily with a fork, 7 to 9 minutes. 3. Meanwhile, heat sesame oil in a large skillet over medium-high. Add bok choy; cook, stirring often, until browned and tender, about 6 minutes. 4. Using a spatula, transfer fish to 4 bowls. Ladle broth evenly over fish; add bok choy. Garnish with cilantro, and serve with lime wedges.